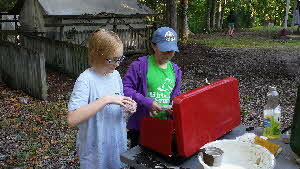 The Durham Girl Scout Day Camp is an important part of many Troop 1806 girls’ camping experiences. The 2019 Girl Scout Day Camp will take place June 17-21, 2019. First-come, first-serve registration opened on March 4, 2019, and the camp is full with 113 campers. The Day Camp is maintaining a wait-list for those girls who were unable to register because of the camp’s capacity limits. 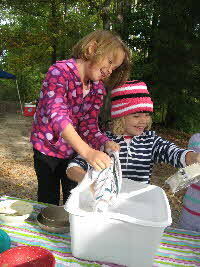 One of the favorite activities for Girl Scouts is going camping. Girl Scout camping trips can be small (a single patrol of just a few girls and leaders), medium (some or all of the troop’s patrols, from Daisy to Junior), or quite large (a camporee with many troops, or a partnership family campout with the Cub Scouts). Camping experiences may be in tents, shelters or cabins. Camping activities may include (but not be limited to!) hiking, canoeing, archery, nature crafts, team sports, orienteering and map skills, star gazing, nature observation, songs and skits, and eating s’mores around a campfire. Not only are the trips fun, but we use the experiences to build camaraderie; learn and advance outdoor skills; and promote Scout independence and personal empowerment. Before Girl Scouts go camping, leaders will assess their emotional readiness (not afraid to be away from parents overnight, can cope with darkness and night noises, etc. ), their physical readiness (strong enough to carry own gear, have necessary stamina and coordination), and their knowledge readiness (can help plan a simple trip, can make a bed, follow directions, etc.). Leaders help girls build confidence and readiness for camping through a progression of skills that may start with a day hike, a cook-out at a local park, or a “backyard camping trip” before advancing to a trip farther away from home. Leaders also spend time with required training, such as Outdoor Skills and First Aider. Because one of the main functions of camping is promoting independence, Girl Scouts at all levels are responsible for many aspects of a camping trip. Girls have a large role in planning trips and are responsible for camp set-up and take-down, cooking food, cleaning dishes and all other necessary tasks with the guidance of adult leaders as necessary. In the same spirit of independence, the Girl Scout camping practice is to have girls sleep in separate but nearby quarters from adults, and to have a limited number of adult leaders accompany girls on camping trips. NCCP Safety Checkpoints, need to use the Group Camping Safety Checkpoint in planning campouts, plus the Safety Checkpoint for any activities being offered during the campout, such as Swimming, Boating, Archery, etc.